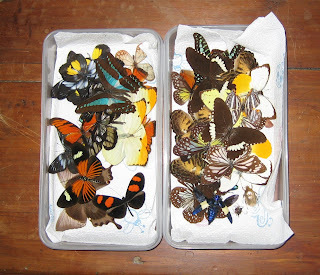 Depending on size, I can "spread" up to six butterflies per night. The picture to the right is the effort of several spreading sessions. After the insects have been prepared, they are ready for use. I decide which insects I want to use in a particular frame, then I match them up with a coordinating art background. Sometimes my backgrounds are ready-made pieces of art paper, and occasionally they are sheets of handmade paper that I order in. I hope to get into the practice of painting some of my own art backgrounds, for for heaven's sake, I don't want to ruin or take away from the natural beauty of the insects! I have taken a Chinese brush painting class in the past, and may try my hand at a few simple, hand-painted backgrounds. However, I don't consider myself a painter. The real artistic work I do is in the preparing, positioning, and coordinating of materials that have been provided to me by Nature. So no, I do not catch my own butterflies, but I certainly do spend plenty of time turning those those raw materials into a finished product! 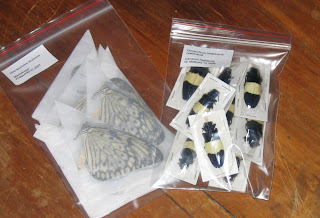 I hope you have enjoyed this brief insight into how my Insect Art is made, and thanks for reading! Wow that sure sounds like a lot of work...but your finished product is beautiful!